14 April – Libera Community Space (Coffee, Books, & Infoshop) needs your help! Libera Community Space is organized by a group of anarchist-minded people in a horizontal and egalitarian way. We promote issues such as gender & sexual liberation, economic equality, and other socio-ecological issues, be it in forms of writings, arts, or social movement.We are openly egalitarian and not dogmatically ideological or religious. We are open for participation from all people, regardless of their backgrounds. However, we do not want to get involved with political parties, NGOs, or anything institutional. We are committed in making a true grass-root and self-organized community. In 2016, in Yogyakarta, Indonesia, Libertas collective was formed. It initiates several discussion panels, anarchist classes, and is also involved in running one of anarchist websites in Indonesia, anarkis[dot]org. Then, one of the individuals in the collective decided to establish a small coffee shop and infoshop: Libera Community Space (Coffee, Books, and Infoshop). Inspired by anarchist tradition, we decided to put our efforts, seize the moment, and get our own venue. We host a wide range of activities, such as a providing a meeting place for cultural and political initiatives, movie screenings, library running, and a building a stronger network of antifascist movement. In collaboration with several anarchist publishers—such as Ikarus Press, Pustaka Catut, and Nihilis Media—Libera also serves as an infohub for curious people who are interested in anarchist and radical thoughts. Since then, even with all of our limitations, Libera has been thriving. We have been hosting all different kinds of people: travelling and local anarchists, students, activists, curious people, even Marxists, trying to convert people to Marxism. Libera has achieved much, and we intend to achieve more. Libera is not just an infoshop or a cafe, but it’s also a community space, a library, and a free internet access zone at which we always work to empower networking communities, broaden our network by outreach, and fight for our cause. 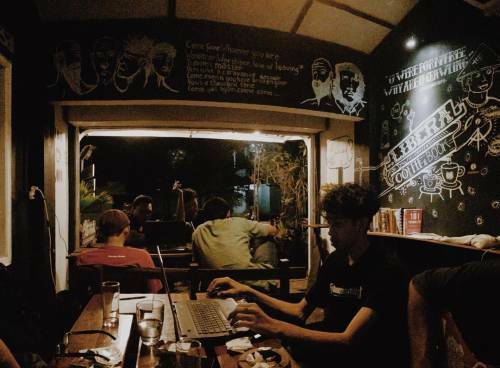 However, since there has been growing number of anarchist circles within Central Java, we would like to rearrange our work place, cafe, co-ops, and provide a place for travelling activists/anarchists to crash at or for meetings with collectives and organizations from different cities.